Its not about a beautiful property in the hills but the luxury of simple living with high thinking. While my stay here, I realized how easy life can be if only we put our resources at the right place. The idea of making more of what we have from our natural surroundings and opportunities. The Goat Village is an inspiration for many villages and farmers, thanks to the initiative that supports successful sustainable agriculture. The goat village is a concept of Bakrichaap people who believe in the five basic pillars of environmental conservation – earthly architecture, nutritious food, energy, water conservation and proper waste management. The Goat here is considered as the Mascot because of the Goat Farming and other Agro practices that provide a better livelihood to the locals. The Goat Village is a 1:30-2hrs hike from base village Panchgani, Uttrakhand. The hike is easy and offers a scenic view of the valley and snow covered peaks on the other side. Each room is equipped with a double bed plus a window-side sitting area overlooking the mountains, which turned out to be my corner in the room. The place is powered by solar energy, there is no electricity in the rooms but you will be provided with lamps and candles. For charging, one can use the common area plug points. 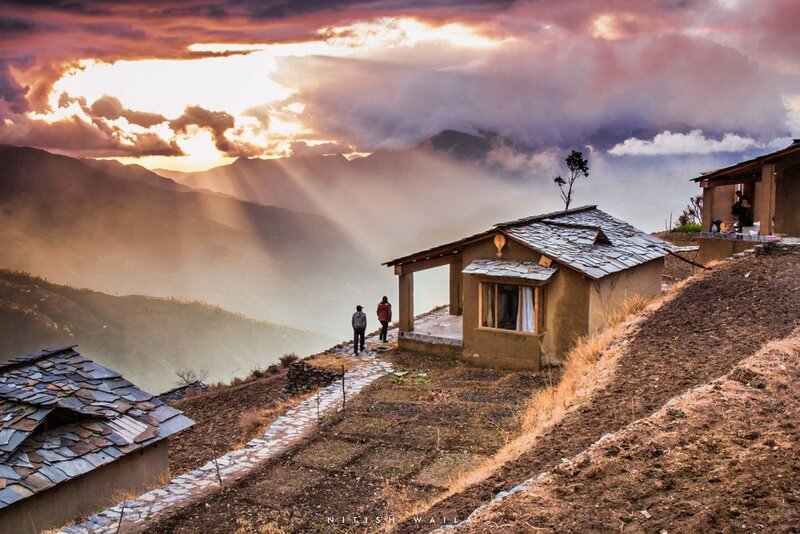 An array of activities can be enjoyed on the surroundings, you can take a village tour, hike to Nag Tibba and ahead to Jhandi or just play the traditional games like gilli-danda, lagori, spinning tops and flying kites in the ground. Mahesh is a warm host and takes care of guest’s comfort and convenience. He is an enthusiast part of the Green People community that supports Agro-tourism movemement with a self-sustained village. You can get in touch with Mahesh before planning your visit, as he can help with the weather and route details. Take a break from your busy life to tread a winding path along a farmland, breath in the fresh air, soak in some sunlight and let the silence enlighten your mind. It is a place you shouldn’t commercialize but let un-commercialize you. Bring yourself back to simple living because offline is the new luxury. For more details about this place, follow link: http://www.thegoatvillage.com/ or inbox us at travelbugbytesindia@gmail.com for queries.